The trend of having owls carry the rings at weddings to the groom or best man seems to have started in 2007, when Eagle International Enterprises Ltd claims to have launched the concept in the UK, building on the experience of Executive Director Stuart Laidler as both a commercial falconer and wedding planner; 2007 (31 December, to be exact) was also the time when an article appeared on the BBC News Web site, titled "Wedding rings duties for barn owl." By the spring of 2009 the trend was firmly underway, so much so as to warrant an article in The Guardian in March, titled “The latest wedding essential – your rings delivered by owl,” about owls as ring bearers, as guardians of your rings for a little while. In a meeting with handler Mike Roberts, the latter, who trains an owl he named Ollie the Owl (a popular name as owls go), suggested the new wedding must-have comes in the wake of many a falconer’s wedding, and that there’s nothing that strange or surprising about it. The author of the Guardian article, Patrick Barkham, surmised this wedding “accessory” might also have to do with one popular owl of recent years, Hedwig of the Harry Potter series. Well, it’s pretty easy actually. And no, the rings don’t get lost. I did wonder about that one, but apparently the bird is so motivated by food (bits or mice and rats, which the wedding guests don’t get to see, of course) that it will respond to a whistle and land on a falconry glove, whoever might wear it. I would prefer the release of doves myself, but I have to say there can be a certain appeal to owls, especially coming from people who see themselves as owlish in some way. Or at least the two ideas come together in my imagination. 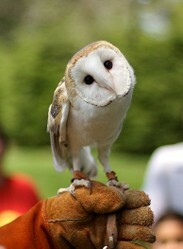 From what I see online on the Web sites of companies providing the services of one owl or another as a ring bearer, by far the most common species seems to be the Barn Owl, or Tyto alba, of which the subspecies Tyto alba alba looks, indeed, exquisite, with its white body and silvery spotting on the head and wings. 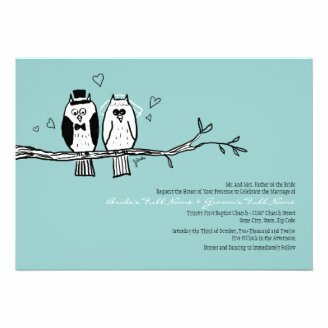 Then there are the popular, bestselling owl wedding illustrations on the print-on-demand site Zazzle. They don’t represent any particular owl species. You get green, red, blue etc. owls, and they’re all fun. 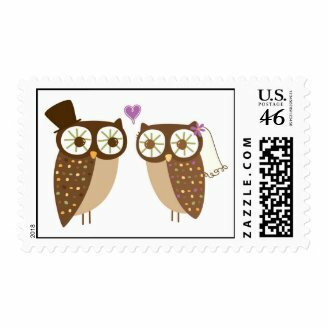 Somehow this trend too, with cute, lovely owls as the bride and groom has caught on as well, if I'm to judge by Zazzle's display of such design among its bestselling wedding stationery. 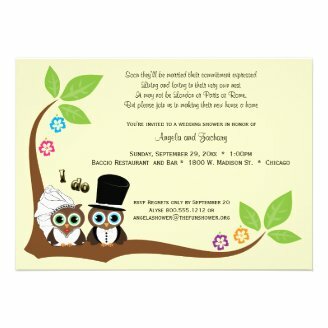 I’m showing here some of my favorite wedding invitations designed around the theme of an owls wedding couple. Remember that the artists who made them usually offer, besides the wedding invitation, save-the-date cards, invites to bridal showers, wedding RSVP cards, labels, postage – basically all the stationery and stamps you need when you plan a wedding. Or if they don't, they should (you may suggest it to them if you like a design in particular; it should be easy to do other items once they have the illustration). Also remember that these designs are, of course, customizable, to include the text you want. It’s all very easy. If you click on an image shown here, it will take you to a page on a Zazzle store where you will find a section titled Personalize it. Just input your own info and you will then be able to preview the design with that text of yours in less than a minute. Chunks of text are suggested as well, so you will have all the important details ready for you to personalize, such as “Save the date,” the actual date of the wedding, a field for the names of the bride and groom, and so on – which will leave only one bit to really think of, now that you have the essential info and the imagery: your personal way of announcing the wedding to the world, in your own words. Note that you can only change the text, and none of the images, the way I have just described; if you really want a certain bit taken out of the image, such as the (image of the) words “I do” I’m showing in the image to the right, it’s a good idea to contact the designer through the Zazzle site and ask them if they can make a slight modification for you. Most designers will be happy to oblige. If you’re running out of ideas for the longer text to go on your wedding invitation, you can take the text as is – or you can browse several other wedding invitations on Zazzle, regardless of theme, to find ideas that appeal to you more. Hope these wedding stationery ideas will lead you to a design that you'll be happy with. There are many more where these came from. Have a great wedding! There are many owls designs on Zazzle, so maybe it is. Mira, Does this downsize -- ;-D -- the ceremony to no ring-bearers? Is this trend still going strong? I admit they can be fun, and some are really beautiful, too! I am already in love with these beautiful birds. 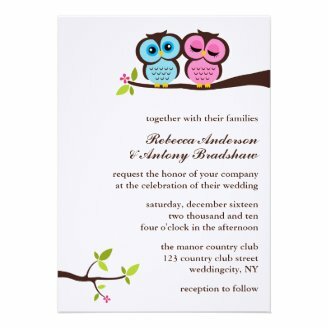 Adore owls - the wedding theme with owls is a great idea. Thank you, Jennifer, for your comment :). I'm intrigued, too, by owls because they're a symbol of both good things and bad things. Thank you for stopping by! Well, I hadn't heard of this owl activity before. As an owl lover I'm definitely intrigued. 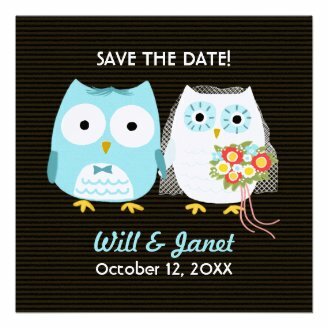 Definitely cool to have owls on the wedding invitation, and a real live owl to deliver the ring, that's worth thinking about. What a unique idea! I'd never heard of this but I give a hoot! Fun fun! I am really surprised though, in some cultures; owls are considered as bad omen. No fault of theirs, of course, I adore the little birds. Valentine’s Day is a time when many people buy rings for their special one. Consider buying a quote ring if you believe in love, hope, and the power of faith.